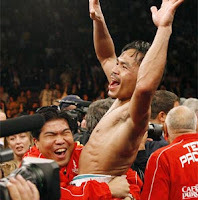 Congratulations to Manny Pacquiao for winning his latest boxing match with Mexican boxer Marco Antonio Barrera. After doing the laundry yesterday morning, I went to bath then bought my lunch (Nilagang Baka). While buying my lunch, I saw on TV that the fight between Pacquiao and Barrera was going to start. I immediately went home then tuned in to GMA 7. It’s just a dismay that the fight lasted for four hours. Even on the beginning of the fight when the national anthem of the three countries were sung it was cut by commercials. Would you believe that? I am please though with the performance of Kyla. She sang beautifully. Just simple and quite appropriate for our national anthem. I just can’t imagine what would be the version of Regine Velasquez for our National Anthem. It would be full of high notes and curly notes. Haha! The fight was actually a bore to me. I can’t believe I stayed watching for four hours. I was so sleepy by 3 P.M., but I still finished the fight. I just hope next time, TV commercials would be lessen. Instead of showing lots of commercials, why not double or triple the advertisement cost. In that way it’s a win-win situation for the TV network and the viewers. i got you tagged. please check it out. thanks. I can imagine Ara Mina singing the National anthem..
Peeeerrrrlaaahs ng sihhhhlangaaaaanaaan..." (in the tune of ayayay pag ibig)..
@my world: i would do that tom morning. @jheng: is that for real? GMA thought of Ara Mina to sing the national anthem? hahaha! That is hilarious!